Organisers of the Prudential RideLondon 100, the closed-road sportive that will see 25,000 cyclists take over the streets of the capital and Surrey, have confirmed the event’s route. Starting in the Queen Elizabeth Olympic Park and finishing on The Mall, the “100” (August 4) forms part of the capital’s Olympic cycling legacy festival. The course profile for the “100” was confirmed this morning, allowing participants to study the route and fine-tune their training to ensure that they are fully prepared for the challenges on offer. Arguably the biggest difficulty is Leith Hill, which ramps up to 14 per cent. 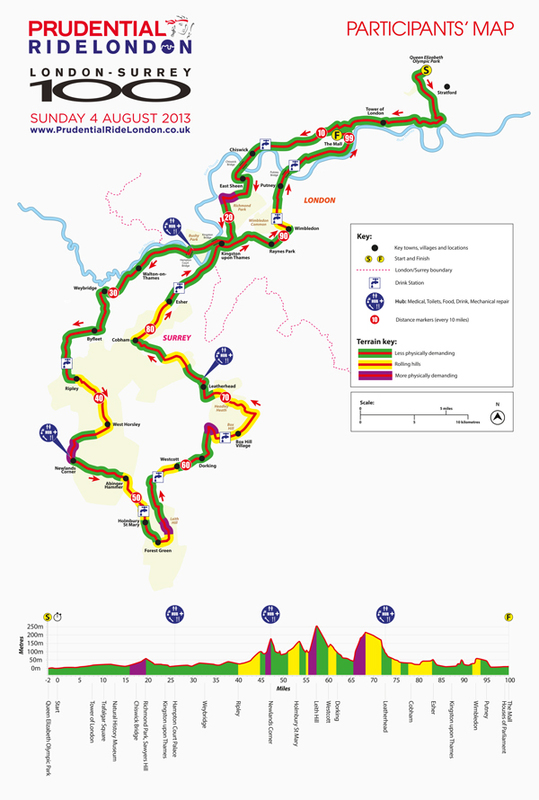 Box Hill – the climb used in the London 2012 road races – will also be tackled. Also revealed are the locations of the three hubs offering riders mechanical and medical assistance, food and drink as well as toilet facilities. These are located at Hampton Court, Newlands Corner and Leatherhead. Additional drink stations are also listed. A men’s pro race will follow on from the sportive, with a central London “FreeCycle” and women’s criterium taking place the previous day.